Forensic Investigation of Stolen-Recovered and Other Crime-Related Vehicles provides unique and detailed insights into the investigations of one of the most common crime scenes in the world. In addition to a thorough treatment of auto theft, the book covers vehicles involved in other forms of crime—dealing extensively with the various procedures and dynamics of evidence as it might be left in any crime scene. An impressive collection of expert contributors covers a wide variety of subjects, including chapters on vehicle identification, examination of burned vehicles, vehicles recovered from under water, vehicles involved in terrorism, vehicle tracking, alarms, anti-theft systems, steering columns, and ignition locks. 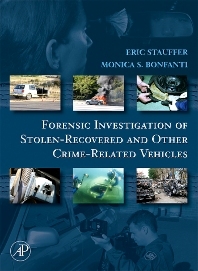 The book also covers such topics as victim and witness interviews, public and private auto theft investigations, detection of trace evidence and chemical traces, vehicle search techniques, analysis of automotive fluids, vehicle registration, document examination, and vehicle crime mapping. It is the ultimate reference guide for any auto theft investigator, crime scene technician, criminalist, police investigator, criminologist, or insurance adjuster. Crime scene investigators, arson experts, insurance agents and agencies, forensic consultants, accident investigators and reconstructionists, law enforcement officials, Private Security Consultants, forensic engineers, and lawyers. Eric Stauffer is a criminalist presently living in Switzerland. In 1998 he obtained his Master-equivalent degree in forensic sciences from the Institut de Police Scientifique et de Criminologie at the University of Lausanne in Switzerland. In 1999 he moved to the United States and, two years later, obtained another Master’s degree in forensic sciences from Florida International University in Miami, Florida. Mr. Stauffer is certified as a Diplomate and a Fellow of the American Board of Criminalistics, with a specialty in the area of fire debris analysis. He is also a Certified Fire and Explosion Investigator (CFEI) and a Certified Fire Investigation Instructor (CFII) both from the National Association of Fire Investigators (NAFI). During his early career as a criminalist, Mr. Stauffer worked as a crime scene officer and a firearms and toolmarks examiner. In 2001, he moved to Atlanta and joined the private sector as a fire investigator and fire debris analyst. As such, his duties involved the investigation of numerous residential, commercial, and vehicle fire scenes to determine their origin and cause and, at the laboratory, the examination of fire debris samples for ignitable liquid residues. In 2006, he moved back to Switzerland to conduct research in forensic sciences, notably in fingermark enhancement techniques and fire investigation. He is currently pursuing doctoral studies at the School of Criminal Sciences at the University of Lausanne. From 2003 to 2006, Mr. Stauffer was Chair of the Fire Laboratory Standards and Protocols committee of the Scientific Working Group on Fire and Explosives (SWGFEX). He also served as a subject matter expert for the development of the fire debris validation kit produced by the National Forensic Science Technology Center (NFSTC). Mr. Stauffer is a recognized speaker and instructor in the field of forensic sciences and, more particularly, in fire investigation and fire debris analysis.